Joe’s grave is located on the Mars Hill University campus. The legend of Joe comes to us from oral tradition, both white and black. The legend was first published in 1907, again in the 1930’s, and in McLeod’s college history, From These Stones in 1956/68. The script for BONDED, a video of the legend of Joe, is historical fiction. Joe and his family, Jane Ray, Andy, Neal, and Cordelia, were owned by J. W. Anderson, one of the founders, and secretary to the Board of Trustees, of Mars Hill College. 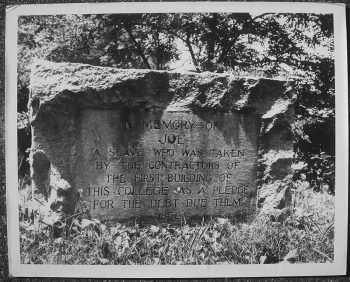 In 1859 Joe was taken by the Sheriff of Buncombe County as collateral on the contractor’s $1,100 debt and placed in jail at Asheville until the debt was paid. Eleven of the college trustees raised the money, paying the debt for Joe’s return to Mars Hill. Joe lived out his life on a small farm below the campus on Gabriels Creek, dying around 1910. Oral tradition says that Joe may have helped make the bricks for the first building. Also, some oral tradition says that Joe went to jail freely. (This may mean that he went without a fight!) The oral tradition claims that Joe was in Asheville’s jail only a few days. – The bricks would have been made 1854-1855 at Mars Hill. – The first building was completed in the spring of 1856. – If Joe were born in 1838 (?) he would have been 18 years old in 1856. – The $1,100 debt with the contractor was not settled until 1859. – Joe must have gone to jail in 1859, forcing settlement of the debt. – Joe would have been age 21 when in jail at Asheville. – Joe died around 1910 and was buried in the Huff family graveyard. – Joe’s family gave permission for his remains to be moved to the college in 1932. Joe’s story has made the press around the world as the only known case where human flesh and blood went to prison for an institution. In the 1930’s the Anderson name was given to the Rosenwald Anderson School in the Long Ridge Community. His name was also given to the CCC Camp on South Main street, Camp Joe. Joe’s master, J. W. Anderson, lost his chattel with the Civil War; after which, he became a Baptist Preacher. Joe took care of him during his last days in Asheville. Joe’s original headstone was embedded by Mr. Tilson in front wall, top right of door (rectangular field stone) of Robinson Infirmary in 1935. Joe’s first resting place on campus was below the drive on Men’s Hill. It was moved in 1955 to Oak Grove, above the drive near the cabin (now Heritage Cabin on lower quad), for construction of a new street, Dormitory Drive. In 1961, Oralene Graves, great, great granddaughter of Joseph Anderson, was admitted to Mars Hill College. She was the first African American to be admitted. In 1977, Charlene Ray, great granddaughter of Doskey McDowell (Doskey being the granddaughter of Joe) was admitted as the first Appalachian Scholar at Mars Hill. She graduated in 1981 with honors. In 1999, the Joseph Anderson and Jane Ray family were celebrated as one of the Founding Families of Mars Hill College. In 2006 the Joseph Anderson Memorial Site was listed in the National Registry of Historic Places. In 2009, Shamia Terry, granddaughter of Oralene Graves Simmons, graduated from Mars Hill College. In 2010, during Founders Week, Dormitory Drive on the college campus is renamed Joe Anderson Drive, and a memorial to Jane Ray is placed at Joe’s grave. Delta Kappa Theta men’s fraternity has adopted the historic Anderson Memorial Site as a project for upkeep, beautification, and interpretation of Joe’s story.